Every day, Watch This offers staff recommendations inspired by the week’s new releases or premieres. This week: We greet the hostile extraterrestrial visitors of The 5th Wave with more movies about alien invasions. Cinematic freak shows that actively attempt to court their own cult following have historically had a rough go; audiences tend to find charm in oddball projects blissfully unaware of their own camp appeal, rather than those that try to force it. Killer Klowns From Outer Space (note the second “K”) wants very badly to be liked. Director Charles Chiodo and his brothers—Edward and Stephen, with whom he cowrote the screenplay—make no effort to obscure just how hard they’re trying, and therein lies the enduring appeal of this bizarro horror-comedy. The Chiodos exhibit no self-awareness in pursuing the heights of weirdness—they’re not poseurs, they’re big, sloppy dogs happily chasing the cult-object ball. The film is patently absurd, but the filmmakers are fully committed to that absurdity. It’s hard not to respect. Everything in this deeply unsettling creepshow scans as a labor of love, from the disturbing handmade clown-faces worn by the titular alien invaders to the detail paid to the particulars of their onslaught. (Animated kernels of popcorn spy on teens and then report back to the evil klowns, whispering secrets in their ears.) 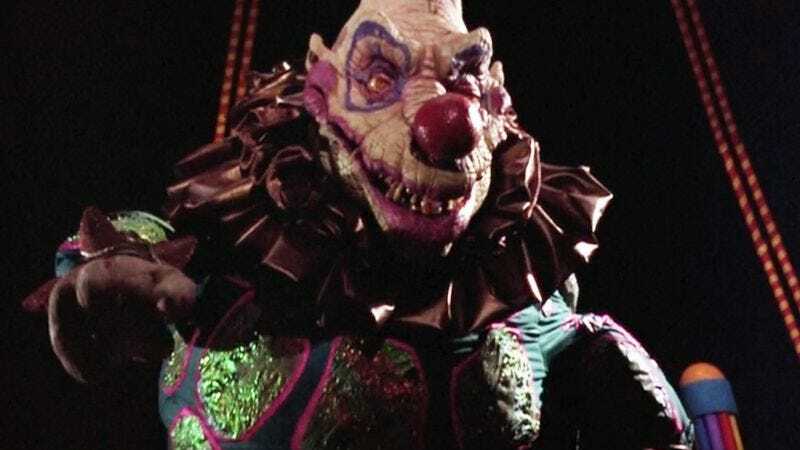 Killer Klowns contains not even the slightest sense of hip detachment in its unabashedly silly frights; the attackers explode when shot in the nose, but irony is their true weakness. A viewer gets the impression that the Chiodos were sitting on pet ideas for years before getting the chance to cram them into this janky funhouse of a movie, like clowns into a tiny car. They seem like they’re flying by the seat of their pants, but a callback joke that pays off an hour later, when John Vernon gets gruesomely murdered after being converted to a human ventriloquist dummy, confirms that the film’s creators knew exactly what they were doing. Before Killer Klowns, the Chiodo brothers made a name for themselves as effects artists, mostly notably in the casually horrifying Large Marge sequence from Pee-Wee’s Big Adventure. Their one and only feature hits the same sweet spot between childlike arts-and-crafts imagery and unleaded nightmare fuel. For all its cheese-flavored aspirations, Killer Klowns can still be downright terrifying when it wants to be. That, however, happens pretty infrequently. For the most part, this three-ring circus of jerry-rigged strangeness wants only to share in a good laugh at the expense of a dumb teen, blissfully unaware that he’s mere moments away from being digested within a cotton-candy cocoon. In practice, clowns are chilling avatars of hideously unnatural terrors, but hard as it may be to believe, they were originally conceived as sources of levity and good times. The Chiodos return the clown to his station as a pure laugh generator, but also refract him through a distorted funhouse mirror. The result is an affably idiotic juggling routine that keeps both kid-friendly foolishness and traumatizing uncanniness up in the air. Availability: Killer Klowns From Outer Space is available on Blu-ray and DVD from Amazon, Netflix, or possibly your local video store/library. It can also be rented or purchased from the major streaming services.